In his frantic efforts to endear himself to his paymasters, former governor of Abia State, Orji Uzor Kalu has yet again for the second time made an indicting statement concerning the whereabouts of the leader of the Indigenous People of Biafra (IPOB), Mazi Nnamdi Kanu who has been missing since last year September after his home was raided by operatives of the Nigerian army. Kalu made this statement in order to avert the seemingly and impending probe of his corrupt practices while in office by the anti-graft agency, the Economic and Financial Crimes Commission (EFCC) and as well as to endear himself to the northern ruling class who are his masters. As it has become a tradition for acclaimed leaders of the southeastern zone, in the sense that any one of them who wants to be seen as being loyal and a friend to the northern caliphate and who strives to remain relevant in their eyes must first make a public statement(s) against their own people before he or she could be considered worthy or acceptable for any political post in Nigeria. This was the situation of the former corrupt governor by claiming knowledge of the whereabouts of the IPOB leader without considering the moral and legal implications it could cost him. Recall that millions of Kanu’s supporters both at home and in diaspora has been searching for him and demanding to know his status from the Nigerian government before Orji Uzor Kalu decides to narrow their search by his recent revelation which is yet to be ascertained. 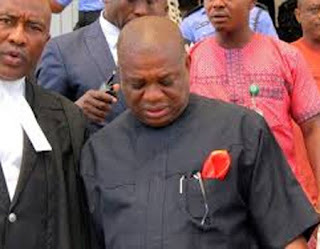 Therefore, for the fact that Orji Uzor Kalu for the second time has publicly claimed that he knows the whereabouts of our leader, is a prove that he is indirectly revealing some secrets behind his possible involvement in the enforced disappearance of the IPOB leader, hence must be held responsible by Kanu’s followers all over the world. Henceforth, wherever Orji Uzor Kalu is seen, he must be compelled to provide our supreme leader, Nnamdi Kanu dead or alive.